Cycle for Survival was founded by Jennifer Goodman Linn—a Memorial Sloan Kettering patient and Equinox member—and her husband, Dave. Following Jen’s own rare cancer diagnosis, they wanted to do something to fight back. Jen sparked this movement and, despite losing her own battle with cancer in 2011, we continue to be inspired by her passion and determination to make a difference. Jen’s whole life was in front of her. She grew up in Livingston, New Jersey, with her mom, Sandy, dad, Len, and brother, Brett. Tenacious from the start, she received her undergraduate degree from Duke University (and was a huge Blue Devils fan), and later received her MBA from Harvard Business School. She was passionate, creative, and determined—and applied her skills to a successful career in marketing. While at Harvard, Jen met her future husband, Dave Linn. They married in 2003, and were looking forward to pursuing career and family dreams. Shortly after getting married, Jen began to experience early symptoms of what would later become an MFH sarcoma diagnosis. She had surgery to remove a tumor the size of a football and began a seven-year battle with rare cancer. After going into remission, Jen wanted to fight back against her cancer—and give back to her doctors at Memorial Sloan Kettering. She created what was then known as “Spin4Survival,” and held the first-ever event at Equinox Columbus Circle in New York City. Shortly after, Jen’s cancer returned and through her unwavering determination she vowed to continue raising money for rare cancer research. In 2009, after two successful events, Jen and Dave decided that the best way to help as many cancer patients as quickly as possible was to officially engage Memorial Sloan Kettering and Equinox. Since 2009, Cycle for Survival has been owned and operated by Memorial Sloan Kettering, which has a full-time team running the events—and Equinox became the founding partner. Jen always said that she never wanted Cycle for Survival to be about her, but rather about all of the patients and families fighting rare cancers. As the movement grows, so does this dedicated community. Today, people come together nationwide to ride and fight cancer: for themselves, their loved ones, and for new and better treatment options. In July 2011, Jen passed away at the age of 40. She sparked this movement to beat rare cancers—and she did it through her trademark passion, love, and belief in living life to the fullest. Despite losing Jen in 2011, Dave—together with their wonderful families and extensive circle of dedicated friends—continues to volunteer his time, helping propel the movement that Jen inspired. Watch these videos to hear Jen tell her story and get a glimpse of her spirited, magnetic personality as she celebrated her last birthday, her 40th, by dancing. At all of our events across the country, we have a special bike that we established in Jen's honor. Cancer survivors and caregivers take turns riding "Jen's Bike”—pushing the Cycle for Survival movement forward, one pedal at a time. 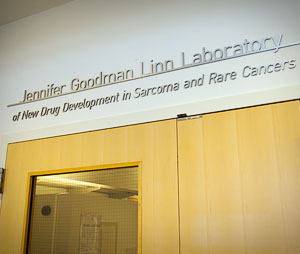 In 2012, shortly after her passing, Memorial Sloan Kettering Cancer Center dedicated a lab in Jen's name. MSK wanted to give Jen and all who loved her this high honor, recognizing her incredible advancement of rare cancer research.